Pitch Perfect: Why Our Shoulders Are Key To Throwing Being able to throw stones with power and precision must have been fun for humans' early ancestors. It was essential, too, since we lack the the fangs and claws of other predators. A recent study suggests the ability to fire rocket fastballs depends on shoulder anatomy that chimps don't share. 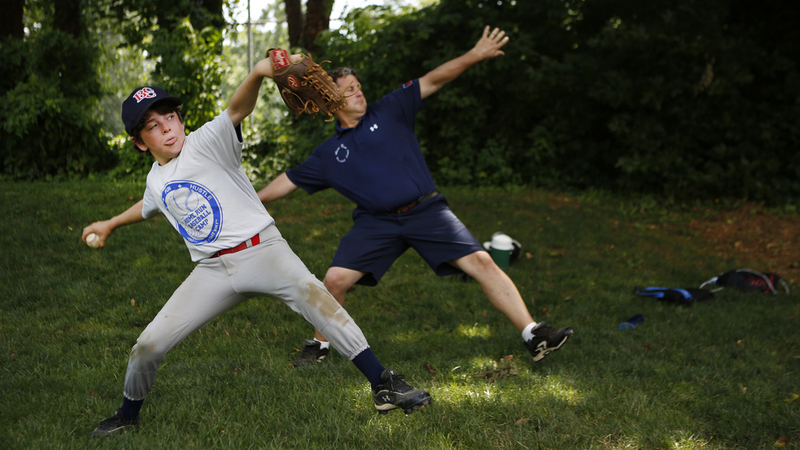 Coach John McCarthy, with Home Run Baseball Camp, talks Harry Kaplan, 12, through a proper pitch at Friendship Recreation Center in Bethesda, Md., in June. The ability to throw a baseball or any object with speed and precision is unique to us humans. And that ability depends on certain features of our anatomy that arose in our ancestors over 2 million years ago, according to a study published in this week's issue of the journal Nature. It's not that other animals can't throw. But their throws aren't as powerful as ours. Consider our closest relative, the chimp. "An adult chimpanzee can throw only about 20 miles per hour, despite being very athletic," says Neil Roach, an anthropologist at George Washington University and an author of the new study. 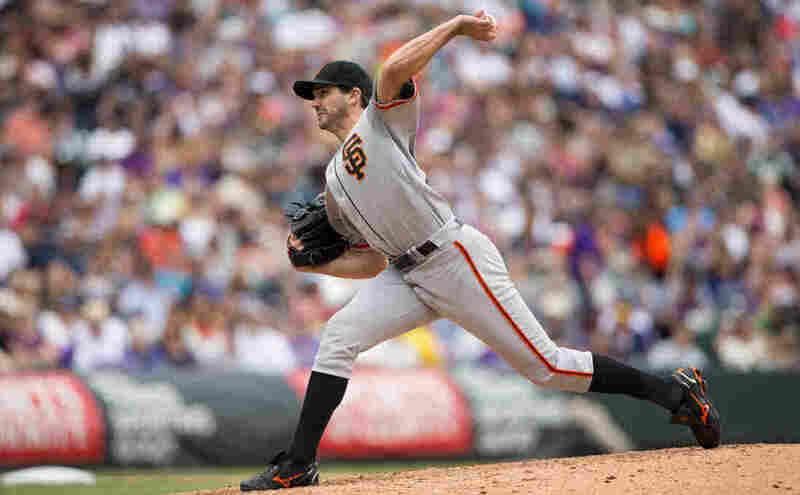 In comparison, a professional baseball pitcher or cricket bowler can throw a ball at speeds of 90-100 mph. So, what makes us such good throwers? To answer that question, Roach enlisted 20 athletes at Harvard University, many of them baseball players. He stuck reflective markers on their bodies — at the shoulder, the elbow, the wrist and the waist — and filmed the students using 3-D cameras as they threw balls into the distance. "That allowed us to know how the motion was generated in three dimensions," Roach says. Next, he and his colleagues used mathematical modeling to analyze the individual movements of the parts of the body involved in throwing. 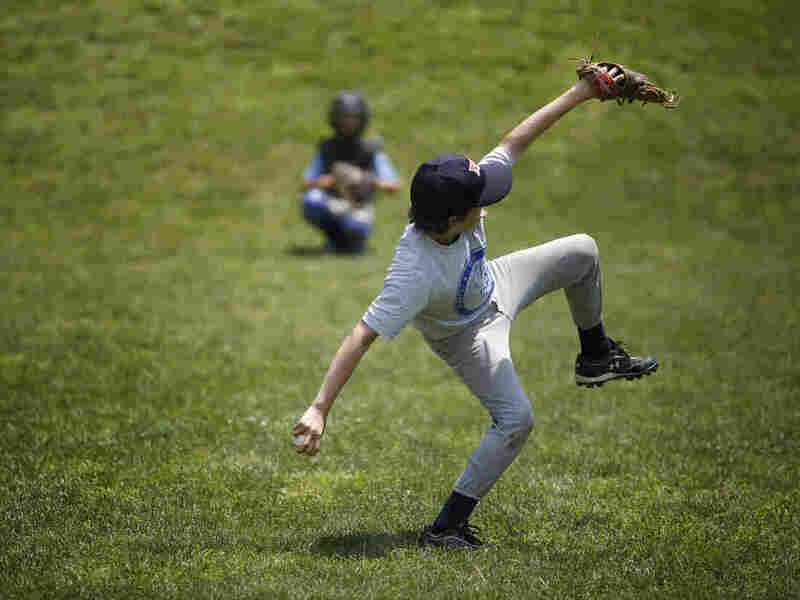 Harry Kaplan practices pitching during Home Run Baseball Camp at Friendship Recreation Center in June. Kaplan's arm is stretched long and toward the ground as his hips are faced away from the catcher. A chimp, in contrast, could never throw a fastball. Our shoulders, it turns out, are crucial to high-speed throws, Roach says, because they store a lot of elastic energy, thanks to a crisscross of ligaments and tendons. These bands of connective tissue are thick and short. When a pitcher prepares to throw by cocking his arm, the fibers controlling the shoulder get stretched like an elastic band. When he whips the arm forward to throw, the muscles, ligaments and tendons spring back to their original positions and release their elastic energy — propelling the ball from his hand. The pitcher's shoulder acts like a slingshot. Human shoulders are broader than our primate cousins', and our shoulder blades are located along the flat of the upper back, explains Daniel Lieberman, a physical anthropologist at Harvard University and a co-author of the study. The shoulder blades of chimps, on the other hand, are positioned more along the side of the body, he says. "If your shoulders are more vertically oriented — like in a chimpanzee — then the muscles can't generate that much power. "Our earliest ancestors also had chimp-like shoulders," Lieberman says. But evidence from two fossils suggests that may have changed with Homo erectus, a species that lived about 2 million years ago. The fossils Lieberman and his colleagues examined had shoulders resembling a modern-day human's. Homo erectus shared two more features with humans that Lieberman and his team think crucial to the ability to throw with power: a slender, flexible waist, which allows us to twist the torso in relation to our hips and legs, and a twist in the shape of the humerus, the bone that connects the shoulder to the elbow. These features "evolved bit by bit," Lieberman says, "but they appear all in a package in Homo erectus." He and his team think the ability to throw also gave this ancestral species an evolutionary advantage. "We don't have fangs. We don't have claws and massive paws," Lieberman notes. Without such built-in weapons, the ability to hurl objects with force and precision must have allowed Homo erectus to become a more efficient hunter. "Homo erectus's long limbs and relatively slender body have long suggested to anthropologists that there's something different about this creature," says John Shea, an anthropologist at Stony Brook University who wasn't involved in the study. He notes that previous studies by Lieberman have suggested that Homo erectus was a good runner. "You put these things together," Shea says, "and you have the primate equivalent of a fighter jet — something that can run for a long time, and has projectile weapons on board." Shea thinks those projectile weapons were likely to have been stones of some sort. (The oldest spears go back only about 400,000 years.) Archaeologists often find "hand-grenade-sized stones" along with skeletons from that era, he says. And scientists initially thought the rocks might have been raw materials for stone tools. But in light of the new findings, Shea says, those stones may well have been weapons used by ancient humans to hunt or to chase away another predator from their kill.